Last edited by jimliker on Tue Jul 27, 2010 6:33 pm, edited 1 time in total. O MY GOD I CANT WAIT! Here's what I got from Blu-Ray.com! Disney will go down in Blu-ray history as the first studio to announce a true 3D title for general release (not tied to the purchase of certain 3D hardware). 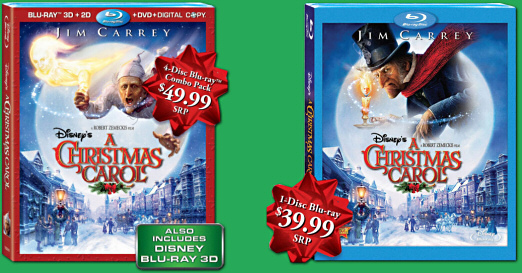 On November 16, the studio will release the Robert Zemeckis-directed CGI movie A Christmas Carol, starring a motion-captured Jim Carrey, in two BD editions: a single-disc release, and a 4-disc combo pack, including no fewer than four incarnations of the movie: conventional BD, DVD, digital copy and 3D BD. List price is $39.99 for the single-disc release and $49.99 for the 4-disc combo. A Combo-pack is just stupid. Who want's a DVD when he's bying the BR ? And a digital copy? C'mon. Just make those things cheapers and cut the crap, ya know. Same thing going on with 'The Princess and the Frog' in our country. We can buy the 'DVD' OR 'BluRay+DVD' ... I miss the option 'Just BluRay', so they can lower the price for that one, now we are paying for a DVD with it. The picture on the news article of the DVD/Blu-Ray Cover, where did you get it from? I was hoping to copy and paste it from the news article but it copied both pictures. I got it off the forums section of Blu-Ray.com. If you want them, here's the link! I'm going for the regular version on the right, it's the most beautiful cover. And ofcours there's no point in buying the 3D-BR if you don't have a 3D-BluRay-player and 3D-TV. Ofcours there's still the 2nd option with the red/green glasses, but let's be honest ... It's crap. A Christmas Carol starred the talents of Jim Carrey, Robin Wright Penn, and Bob Hoskins, and follows the classic Dickens story of a miser who is visited by ghosts on Christmas Eve and has a change of heart. It’s been made into movies before, including the Mickey Mouse version in the 1980s. Which version of A Christmas Carol is your favorite? Tomorrowmorning they come to deliver my Panasonic G20 flatscreen and BluRay-player ... *WOOT! * ... I've been saving almost a year for that. So now it's sure I'm going for the 1-disc BluRay.